So it is the last day of the month and I should be finishing up the April cookbook review and thinking about May’s cookbook but to be honest I am actually making the final two recipes from the Family Circle cookbook right now as we speak. So I guess I will have to play ‘catch up’ yet again this weekend. BUT I still want to post a new recipe today. And despite how unbelievable this sounds I have 4 (yes FOUR) new recipes already to go I just have to copy and paste them to the blog and hit post (I know shocker, huh). This post is one of them! I mentioned back in March that since it was my anniversary blogging month I wanted to feature a few blogs that I have enjoyed reading and who have inspired me along the way. I started this with The Hungry Housewife and then I got a pesky bug (you know the one… the computer bug) and could not blog for a while (I am still trying to recover from that nasty thing). Anyways, another one of my favorite blogs, and one that I have been reading for awhile, is My Kitchen Cafe (remeber I also gave her the Sunshine Shout Out). Mel, the author of this blog is funny and sweet and has tons of great recipes and tips. Every recipe she blogs about looks and sounds delicious; in fact my bookmarked pages from her blog keep growing and growing (how will I ever make it all!). The couple of recipes I have made from My Kitchen Cafe have been success, in fact these hot hoagies have made an appearance on my dinner table several times. Because Mel has a large family of 6, all guys except for herself, all her recipes are family friendly and usually make enough to feed a crowd. Not only does the blog My Kitchen Cafe, have a large collection of her ‘tried and true’ favorites; which vary from desserts to breads and soups, to main entrees and sides, but Mel also offers great kitchen tips. Like how to successfully plan a menu, or make Sushi (today’s detailed ‘how to’), or her recommendations for must have pantry staples! My Kitchen Cafe is a clean well put together blog and is easy to navigate. Mel includes a couple of great photos for each recipe and if she is giving step by step instructions on for her ‘how to guides’ then she also includes step-by-step photos. All of the recipes Mel features on her blog are either her own, from friends and family, or from her favorite cookbooks and cooking magazines. Below is one of her unique recipes for Enchilada Pasta. 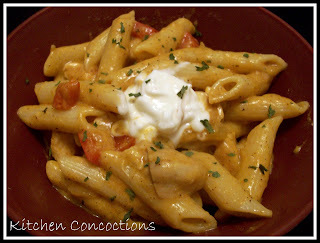 This dish tasted great and was a fun twist on the regular pasta night! Notes: I did adapt the recipe some to our tastes. The original recipe called for olives and I omitted them and added corn and Rotel Tomatoes. Also the recipe calls for the chicken to be precooked, but I did not have any precooked chicken on had so I cooked some up while making everything else and added a few more spices. Bring a large pot of water to a boil. Cook the pasta until tender. While the pasta is cooking, heat the oil in a large nonstick skillet and add chicken and taco season. Cook thoroughly until chicken is cooked through. Remove chicken and add onion (you may need to add more oil). Cook for 2-3 minutes until onion is translucent. Add the garlic and red pepper and cook for another 2 minutes, until pepper is barely tender. Add the cooked chicken, green chilies, spices, enchilada sauces, corn, and Rotel Tomatoes. Let the sauce simmer for about 8-10 minutes. Add the sour cream and cheese and heat through, until the cheese is melted (but don’t boil!). Pour the sauce over the hot pasta. Garnish with extra sour cream, cheese, green onions or crushed tortilla chips.